On Wednesday evening, United Hatzalah volunteer EMS personnel and staff from Magen David Adom treated a bus driver who was moderately injured after he was stabbed while driving a bus near Afula. As a result of the stabbing, he lost control of the bus and slammed into a car, a water pipe and a pedestrian. Three other people aside from the driver were injured and treated by the emergency services first responders. Passengers on the bus were uninjured in the incident. It is as of yet unclear what prompted the stabbing of the driver and the incident is under police investigation. 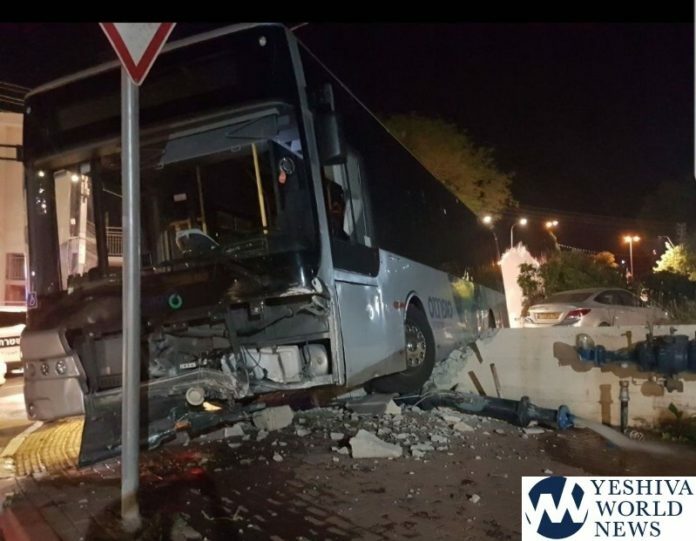 The driver was taken to Ha’Emek hospital in Afula for initial treatment while in moderate condition, and after he was stabilized he was transferred to the neurosurgery unit at the Rambam Medical Center in Haifa. Eye-witnesses from the bus said that two young teens who were riding on the bus got into an altercation with the driver and stabbed him. The youngsters fled the scene before they could be apprehended. Police and security services are conducting a widespread search for the subjects. were the attackers arabs or Jews?